Karin Rettger offers input on Health Savings Accounts (HSA’s) in Pension & Investments. Plan sponsors tend to have trouble engaging participants in health savings accounts (HSAs)—educating them, getting them to participate and seeing HSAs. Karin Rettger discusses Health Savings Account as an integral part of retirement. Employee Benefit Adviser Magazine recognizes Karin Marrs Rettger as one of the Most Influential Women in Benefit Advising for a second consecutive year. Karin Rettger has been elected to the Plan Sponsor Council of America (PSCA), a division of the American Retirement Association. She also serves as Vice-Chairman of the Health Savings Account (HSA) subcommittee. Employee Benefit Adviser Magazine recognizes Karin Rettger for her efforts to encourage more women to join the benefits industry. Plan Sponsor Council of America awards Karin Marrs Rettger their 2018 Volunteer Service Award. Solutions and relief for plan sponsors regarding eight HSA pain points. HSA experts discuss automatically enrolling participants in Health Savings Accounts (HSAs) to increase participation. The reality of healthcare costs in retirement and what employers can do to help. 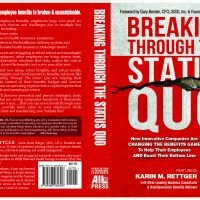 Stop accepting the status quo of paying more for less when it come to employee benefits and healthcare! Learn new strategies, reduce costs and better understand the benefits industry. Proven methods to help employers manage costs, maximize capital and drive dollars to the bottom line. Doing More with Less is the playbook for any business leader who has questions about employee benefit related issues and understands the necessity of planning for and dealing with them now.